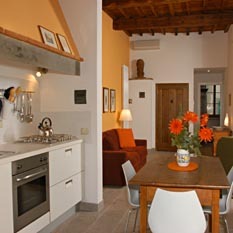 At Home in Florence exclusively rents a spacious 2 bedroom, 2 bathroom apartment with terrace on Borgo La Croce, a quiet walking street beginning at Piazza Beccaria. This is a charming neighborhood where Florentines live, shop, and enjoy family dinners in small restaurants. Nearby is the daily San Ambrogio food market, the popular Piazza Ciompo flea market, well-known restaurants like Il Cibrèo and La Baraonda, a marvelous pastry shop Dolci e Dolcezze, and Vestri, a popular stop for hot chocolate Italian style! And, it's just a 10-minute stroll to the Duomo, the center of historic Florence. Take a look around! Reserve it now! 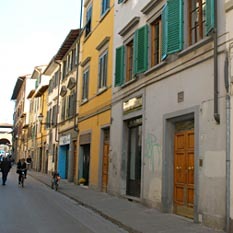 Borgo La Croce is a quiet walking street with small shops and restaurants. It's the Florentines' Florence. 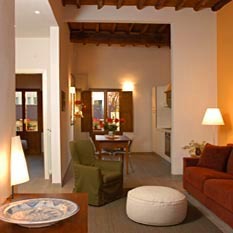 A spacious living room offers the perfect place to relax after a busy day exploring all that Florence offers. 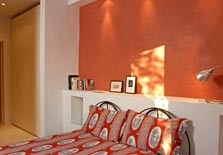 The spacious master bedroom is warmed by natural Tuscan light filtered through large windows. 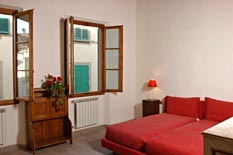 The second bedroom is furnished with Tuscan art works and rustic antique furniture. 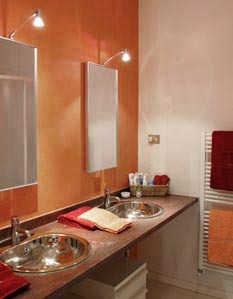 The master bath has rich design appointments and all the amenities of home. 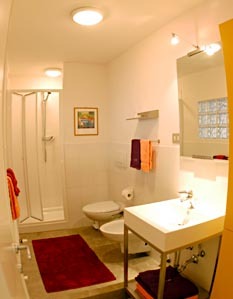 The second bathroom is a fully appointed bathroom handy for a family stay. A fully equipped modern kitchen is just what you'll need after returning with armfuls of groceries from the nearby San Ambrogio market. 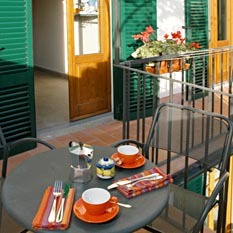 A comfortable terrace with a peek at the Duomo is perfect for a morning espresso or an early evening aperitivo.